In our recent visit to Beijing, we visited the studio of the renowned Chinese artist/photographer Wang Qingsong. Speaking with his wife Fang, I asked her if her husband, working as do other Chinese artists under the strict eye of the People’s Republic, ever felt the need to censor himself. She emphatically responded with a firm no, but with the caveat that artists in China constructed well-conceived strategies for delivering their message under the radar. In other words, they create messages that are too subtle, too complex, or simply too sophisticated for the authorities (not typically well versed in contemporary art) to decipher. Fang referred to this highly crafted artistic technique of subterfuge as the “soft bubble.” I have thought about this quite a bit (I too have made use of the soft bubble), as much of the Chinese contemporary art I saw during my recent travels employs concepts and artistic strategies that do in fact subtly circumvent the reigning status quo. The soft bubble might be thought of as a coded idea, an idea couched in metaphor or symbolism that must be taken apart to be fully understood. This strategy is much like the American spirituals of 19th century African Americans, who used Christian ideology and biblical narrative to disguise the distinctly subversive and political nature of their songs of protest. 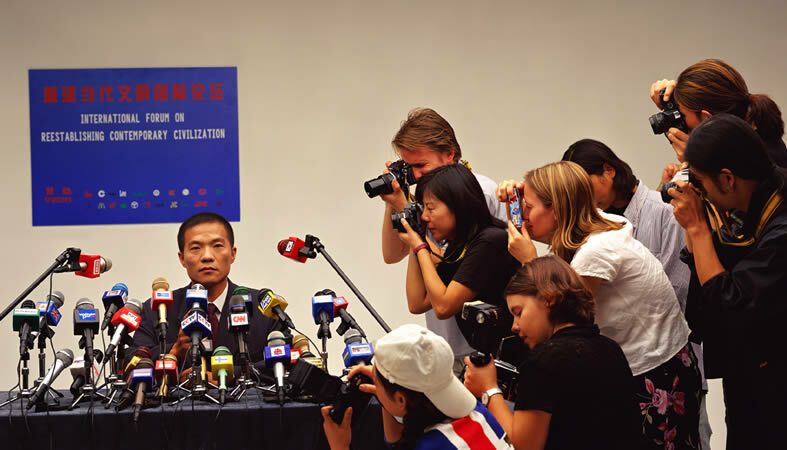 While I wouldn’t say this particular work by Wang Qingsong is exactly subtle – here we see a faux military spokesman (performed by the artist) in front of a battery of cable news microphones depicting the power of media – but where the soft bubble enters into the picture is in the way this photograph blurs the line between reality and fiction. Is this pro-government or anti-government? Is this real or is it not? You could read it both ways, particularly if you are an official without an appreciation of artistic parody and irony. On the other hand, the sign: International Forum on Reestablishing Contemporary Civilization is so cunning, so historically precise, and of course so beautifully ironic, that I could imagine a Chinese official thinking such a government agency actually does exist in the People’s Republic. And well, maybe it does! But this is the power of the soft bubble. When the artist employs techniques of illusion and transformation that defuse reality and blur the line between what is real and what is not, investigating the demarcation between what is and what could be (that Third Space where we lose the distinction), the message becomes all the more powerful and penetrating. When art brings reality into question, it is most successful. The soft bubble is the one that bursts the real bubble.